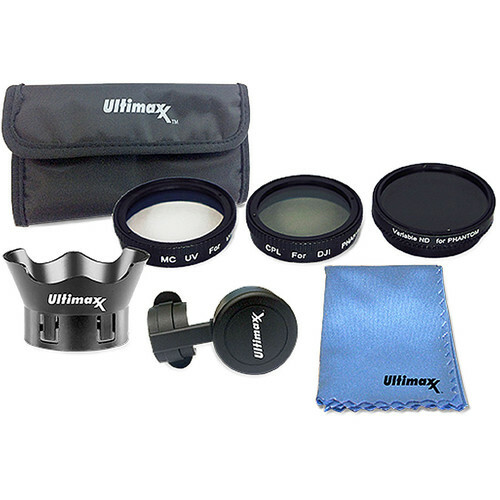 Protect your gimbal lens and enhance the photos it takes with this Studio Series 7-Piece Filter Kit for DJI Phantom 4 Drones from Ultimaxx. This filter kit includes three filters: UV, CPL, and variable ND2-ND400. When attached to your Phantom 4 gimbal's lens, they can help filter and reduce light from entering the lens, giving you the ability to adjust the look and quality of your photos in a variety of daylight conditions. All of the filters feature a digital multi-coating to help provide a layer of protection to the optics.